Eithne has not yet uploaded a photo of Daisy. Daisy is an easygoing wee thing loves walks (we did the West Highland Way and she loved every day) and loves to coorie in on the sofa with me in the evening. She is used to sleeping downstairs but when the kitchen door opens in the morning she wheechs up the stair and jumps into bed with me, She gets on well with other dogs and is used to visiting doggy houses and having dogs to stay with us - she is normally a considerate hostess! Daisy has yet to receive opinions from dog sitters on Gudog. 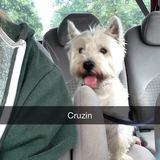 Want a profile for your doggie like Daisy's?